IG: Police Constable to Earn N50,000 | Life is short,have fun!!! “Acting Inspector-General of Police (IG), Alhaji Mohammed Abubakar, said Monday in Ikeja, Lagos State, that the least paid police officer (constable) would go home with a monthly salary of N50,000, if his proposal to the Presidency scales through. This will mark a sharp increase, as a constable is currently paid N28,000 a month. He made the disclosure at the Police Command Headquarters while addressing the personnel as part of his visit to the state. His declaration sent the policemen at the briefing ground into a boisterous celebration. Abubakar said he took the decision to seek improvement in the welfare of the personnel to boost their morale. Soon after pledging to upgrade the welfare of his officers, Abubakar sounded a note of warning to errant officers. He said any policeman found wanting of the laid down rules would not be spared. He also said 50,000 officers of the Force were being trained in intelligence and crime investigation to check the insecurity in the country. According to him, 16,000 of the 50,000 would get intelligence-based police training, while another 10,000 would go for detective course training. Abubakar disclosed this when he led top police officers on a courtesy visit to Governor Babatunde Fashola in continuation of his familiarisation tour of police commands in the country. The News Agency of Nigeria (NAN) reported that Abubakar had earlier addressed officers and men of the command, stakeholders and traditional rulers. He said the security situation in the country called for more proactive measures if the nation must win the war against violence. The police boss pledged that he would restore the lost glory of the police, but noted that this might not be possible without the support of the officers and the public. “We want to build a people-friendly police, which every Nigerian would be proud to be associated with; a force people would be willing to assist by offering information, and they will see the result immediately,” he said. He commended the Lagos State Government for supporting the force, stressing that if other states in Nigeria emulated the state, the crime situation would be drastically reduced. The IG said that about 300 patrol vehicles would be deployed in the nation’s high ways to replace the dismantled road blocks. “The vehicles will replace the recently dismantled road blocks and help to boost the effective patrolling of our highways,” he said. Abubakar said unfortunately, road blocks were being used for purposes different from their original intention. He said the road blocks, as used in the country, had been turned into an aberration which affected effective policing. He further said the road blocks were being used to extort money from motorists over the years, rather than to fight crime. “We have gone ahead to stop road blocks because we do not understand the reason why these road blocks should be there. “This is the only country in the world that you have permanent road blocks. But really in security situations, road blocks are temporary measures that are only put in place after particular security issues have been taken care of. “Unfortunately, we have made it a permanent feature of our security manoeuvres,” he said. According the IG, “That is why we are doing everything possible to build the capacity of our officers. Capacity building is the key to effective policing in the country and from our analysis those road blocks were not doing us any good. He added that all the four premier police colleges in Enugu, Ikeja, Maiduguri and Kaduna would soon be rehabilitated and repositioned to deliver quality training to men of the force. 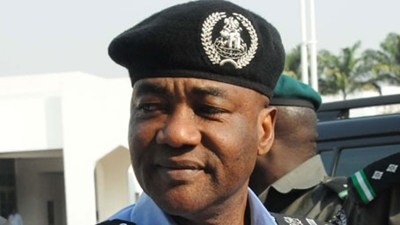 Abubakar said that the police were currently in a major transformational process, promising that the Force would soon metamorphose into a people-friendly, effective-crime fighting establishment. He urged Nigerians to support the Force’s Community Policing Initiative by volunteering relevant information that would further strengthen the security of lives and property. Abubakar promised to strengthen the operations of police institutions to enable them to undertake their responsibilities as officers’ training schools. In his speech, Fashola commended the police for their efforts to curb crimes, in spite of insufficient equipment. He hoped that Abubakar, who had passed through the rank and file to the top, would be in a better position to take the force to a higher level.